Amanda Brambila approached the microphone at City Hall as the final speaker in the Santa Cruz March for Science with UC Santa Cruz’s Society for Advancement of Chicanos/Hispanics and Native Americans (SACNAS) chapter following with banners and picket signs. “Behind me are STEM students from many backgrounds, genders and ethnicities […] We are first generation college students, we are underrepresented. And we stand here with the community for a same cause,” Brambila said to a cheering crowd of locals — some wearing dinosaur suits, some holding signs. Brambila is a graduate student in the molecular, cell and developmental biology track and the president of the UCSC SACNAS chapter. SACNAS members marched with about 400 Santa Cruz community members on April 21 in March for Science, a national movement that began last year to promote evidence-based policy and celebrate the role of science in society. March for Science returned for its second year, this time with a speaker from SACNAS to speak on diversity within STEM fields. The event was organized by Santa Cruz Indivisible (SCI), a community organization that engages residents with progressive politics at the local, state and national level. Scientists from SCI also cited urgency within the political climate as another reason for the march. The UCSC SACNAS chapter led marchers down Pacific Avenue toward the annual Earth Day Festival at San Lorenzo Park, where rows of community organizations like the Sierra Club could engage with the Santa Cruz community. SACNAS brought its vision to the march, as they advocated for fostering success of Latinx and Indigenous communities within STEM sciences — a field dominated by white males. SACNAS president Amanda Brambila spoke to the importance of the march for her community. Black and Latinx workers are still underrepresented in the STEM workforce today, according to studies conducted in January by Pew Research in 2018. While the Black community represents 11 percent of the U.S. general workforce, they only represent 9 percent of the STEM workforce. The Latinx community represents 16 percent of the U.S. workforce, but only 7 percent of the STEM workforce. This underrepresentation in the STEM workforce becomes especially problematic when considering an environmental perspective. Katherine Egland, chair of the Environmental and Climate Justice Committee for the NAACP National Board of Directors, said low-income communities of color will be bearing most of the adverse effects of global climate change and other environmental hazards. When communities of color are at risk, it’s important for these communities to have a seat at the scientific table — but there are still barriers. Jesse Cisneros Solis, a fifth-year physics major and SACNAS member, explained how his immediate love for engineering and physics clashed with this underrepresentation in STEM fields. 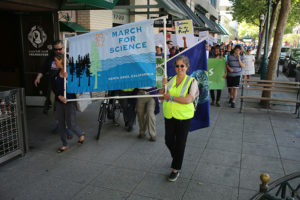 SCI organizer Amanda Altice said scientific accuracy within the national discourse of climate change was one of the primary motivations for the march, but diversity was highlighted as a critical component to this national dialogue.